For the scribes responsible for supplying the text of the missing pages in these playbooks, the unit of reading was the whole play, or the whole playbook. The pen facsimilist at work in the Folger's copy of William Alexander's The Tragedy of Darius (1603), for example, has copied every detail of the title page (except the horizontal ornament) and taken steps to reproduce (i.e., outlined in pencil) the tail piece on the very last page of the book. 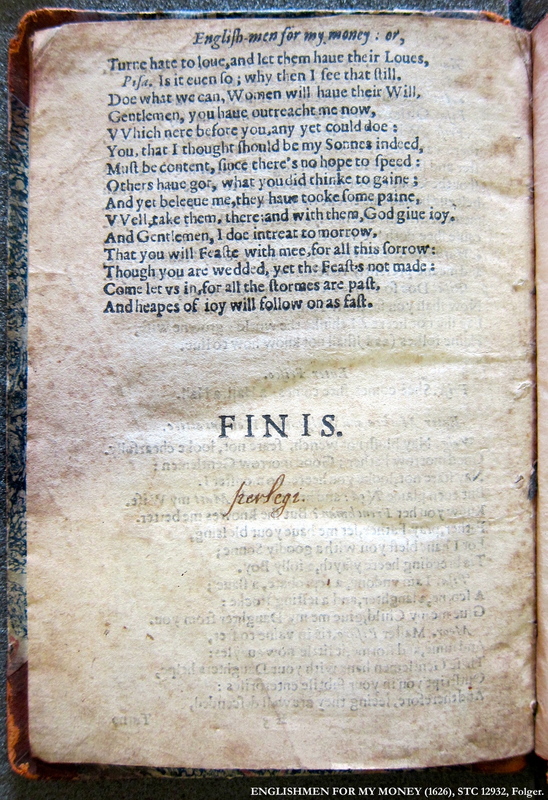 The scribe of the supplementary pages of The Two Maids of More-Clacke (1609), Copy 5, is also emphatic about signaling the end of the play (or "Finis") and thus the whole play as the primary unit of reading. The Two Maids of More-Clacke (1609), STC 773 (Copy 5), Folger. "[I]t could be argued," William H. Sherman writes, "that the words an signs that signal the final boundary of a text, telling its readers that it is a discrete and in some sense complete unit, do more to make it a book, and to announce it as such, than any other feature (with the possible exception of the stitching and binding). In a very real sense, a text cannot be a book until it is finished. "[i] There is indeed evidence that early modern readers also treated the whole play(book) as the unit of reading. See, for example, the last page of the second quarto of Englishmen for My Money; or, A Woman Will Have Her Will (1626), where the reader has simply written "perlegi" (Latin for "read") underneath the printed "FINIS." Englishmen for My Money (1626), STC 12932, Folger. Fedele & Fortunia (1585), STC 19447 (Copy 1), Folger. Promos & Cassandra (1578), STC 25347 (Copy 1), Folger. FIRST. One of the major (and obvious) constraints of printing a text is type supply. Early modern printers had a limited supply of every type sort and, sometimes, if the demand on a certain sort was too high, they ran out of it. (One really good example of this is printer-publisher Richard Jones's 1590 edition of Christopher Marlowe's Tamburlaine, which features multiple characters whose names begin with 'T'. The demands on the italic 'T' are so high that the printer has to resort to using lower-case italic 't's in speech prefixes. It looks like shoddy printing, but it's just a symptom of limited supplies.) I believe that this is how/why pilcrows began to phase out of a lot of printed matter by the end of the sixteenth century. The exceptions would have been printers charged with producing large, high-end books (Bibles, for instance), who were commissioned for such projects because they had the type supply to handle them. So, what you end up seeing in a lot of sixteenth-century playbooks are efforts to implement certain patterns of pilcrow use, but because of type supply, that pattern is not applied consistently throughout. I don't think it's a case (at least in this transitional period) of indents (i.e., a blank) being easier to set than a pilcrow. They both required the same amount of labor on the part of the compositor. Haslam also intimates (although he doesn't make it all that explicit) that many incunabula that left spaces for a rubricator to supply pilcrows by hand did not ultimately get rubricated. That meant that readers may have grown used to reading the spaces as stand-ins for pilcrows (and therefore equally effective in signaling the start of a new unit of text). SECOND. As Houston demonstrates clearly and repeatedly throughout Shady Characters, typography and mise-en-page are inherently instructional. It is rare to find a book that explicitly instructs readers in how to navigate its typographical arrangements because it's those arrangements themselves that teach us how to navigate. For this reason, typography/book design is a conservative medium. [viii] Once readers are used to using certain symbols and other features of mise-en-page to navigate books, printers risk alienating their readership if they experiment too much with what works. In this way, the printed pilcrow is a skeuomorph for the manuscript capitulum. It helps ease readers into a new medium—it's probably not strictly necessary, but it adopts a feature of the previous technology so the newer one doesn't feel so foreign. But once readers understand from the particular placement of pilcrows how to navigate the mise-en-page of a typical playbook, for example, they no longer need the scaffolding that the pilcrows provide. It's like readers become able to ride the bike without training wheels. Coupled with the problem of type supply I mentioned above, this new readerly proficiency is what ultimately makes pilcrows redundant in all but the most expensive print genres. [i] William H. Sherman, “The Beginning of ‘The End’: Terminal Paratext and the Birth of Print Culture,” in Renaissance Paratexts, ed. Helen Smith and Louise Wilson (Cambridge: Cambridge University Press, 2011). [ii] See Gary Taylor, “The Structure of Performance: Act-Intervals in the London Theatres, 1576-1642,” in Shakespeare Reshaped, 1606-23, ed. Gary Taylor and John Jowett (Oxford: Clarendon Press, 1993), 3-50. [iii] See Keith Houston, “The Pilcrow,” in Shady Characters: The Secret Life of Punctuation, Symbols & Other Typographical Marks (New York: W. W. Norton & Company, 2013), 15–16; and Malcolm B. Parkes, Pause and Effect: An Introduction to the History of Punctuation in the West (Berkeley: University of California Press, 1993), 43 and 302. [iv] Andrew Haslam, Book Design (London: Laurence King Publishing, 2006), 73. Thanks to Houston for directing me to this reference. [v] See Claire M. L. Bourne, “Dramatic Pilcrows,” Papers of the Bibliographical Society of America 108.4 (2014): 413-452. [vii] These thoughts are modified from my email correspondence with Houston about the disappearance of the pilcrow. [viii] On the glacial pace of “typographic evolution,” see Goran Proot, “Converging Design Paradigms: Long-Term Evolutions in the Layout of Title Pages of Latin and Vernacular Editions Published in the Southern Netherlands, 1541–1660,” Papers of the Bibliographical Society of America, 108.3 (2014): 302.